There’s no beating about the bush, I love coffee. I look forward to it every morning and if I didn’t have my daily cup of coffee I don’t think I could function. And when I have that daily fix, I often get my daughter a babyccino. But there is one aspect of our coffee culture which bothers me – the amount of disposable coffee cups we get through. 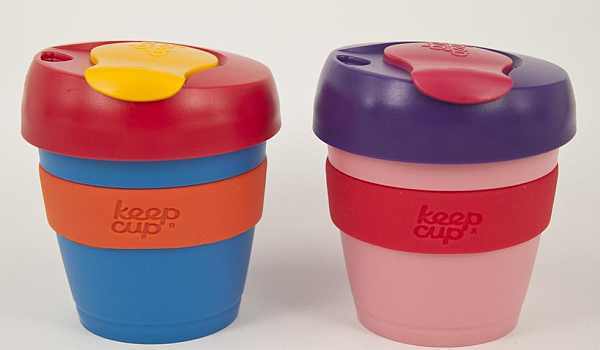 You might remember we told you about these great looking reusable Australian-made Keepcups before on Babyology, but I have to admit they’re one of those things I keep meaning to buy, but never get round to it. However, this new addition to their range has got me straight onto the ordering page. It’s a new smaller size just right for little hands. Exactly the same concept as the original cup – you design your own colour combination from a huge range of different options on their user-friendly website. I found it very hard to make a final decision on which one to go for, but once my daughter got involved choosing hers I reckon we’re going to have the funkiest cups in town! They last up to four years, which is a lot of disposable cups kept out of landfill. The new extra small size costs $10 plus shipping – check out the whole range at Keepcup.